[AWAJI, 22 May 2018] Uber has reached an agreement with both Awaji Island-based Hyogo Prefecture taxi companies as well as the Awaji District Administration Office to conduct its first taxi pilot program in Japan. This trilateral endeavor will allow both international and domestic tourists, along with the residents of Awaji Island, to use the Uber app to request local taxis, at the push of a button. As a part of Awaji’s comprehensive tourism strategy, Uber will launch uberTAXI on its app to provide Awaji residents as well as tourists and visitors with reliable and safe transportation to their destination, including many of the local tourist attractions.. The pilot is part of a joint effort that was planned in February with the Hyogo Prefectural Government and local stakeholders to promote tourism in Awaji Island, launching this summer, as the local transit option until March 2019. The Uber app is used in more than 600 cities around the world and is supported by more than 50 different languages. 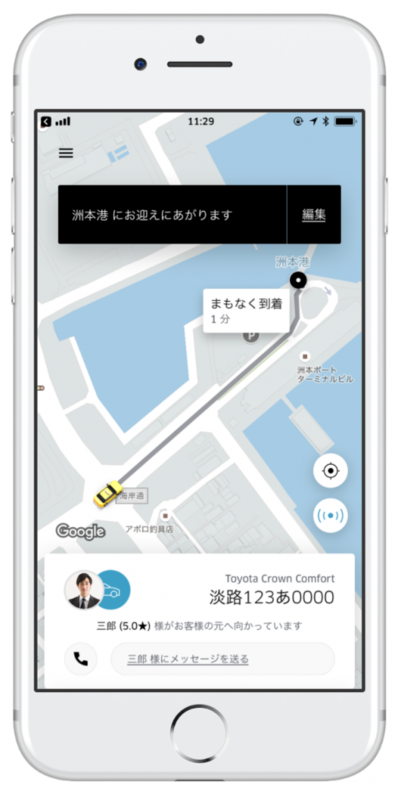 Uber app users will be able to request a ride by selecting uberTAXI to travel around Awaji Island with the convenience of using their own language setting on the app. Visitors to Awaji Island will now have a new means of navigating the island with the confidence of using a familiar language, and globally recognised technology, to locations that were previously difficult to reach. Awaji Island is located about an hour from Osaka and Kobe, which are in the heart of the Kansai (Western Japan) region. The island is linked to Japan’s main province, Honshu via the Akashi Kaikyo Ohashi Bridge, which boasts the longest central span of any suspension bridge in the world and is also connected to the Shikoku province via the Onaruto bridge. According to the “Kojiki”, a collection of myths concerning the origins of the Japanese islands and the oldest historical chronicle of Japan, Awaji was “the first island“ created. It was also called “Miketsukuni” since ancient times because of the important role that it played supplying food to the imperial Court. Awaji Island is blessed with a variety of resources, including a rich history, culture, specialty foods and a natural environment that have made it a popular tourist destination. The island attracts many visitors each year with its hot springs, the whirlpools of the Naruto channels, and ‘Awaji Ningyo Joruri’, a traditional performance art with a 500-year history. The island is also preparing to register as a world heritage site.